The northern prairie skink (Eumeces septentrionalis) is a small lizard, 13 – 20 cm in length, that inhabits regions of sandy soils in south-western Manitoba. It is listed under Canada’s Species at Risk Act as “Endangered”. The main reason for its endangered status is its reliance on mixed grass prairie habitat in regions of sandy soil. Much of its limited habitat in south-western Manitoba has been lost to human encroachment, agricultural conversion and invasion of prairie by woody vegetation and exotic weed species. Its habitat continues to be destroyed or degraded at present. Survival of this species in Manitoba depends on reversing current habitat loss trends (COSEWIC 2004). Approximately 50% of the prairie skink's range in Manitoba lies in the hands of small private landowners. These individuals have direct control over critical habitat for skinks on their land. Even within their known range in south-western Manitoba the prairie skink is a poorly understood species with a low public profile. Very few Manitobans have ever seen a skink and most know little about this animal or its endangered status. Land use decisions made with no knowledge of skinks, or their critical habitat, are unlikely to benefit this species. Raising awareness of skinks and promoting the importance of critical habitat conservation will encourage landowners to make the decision to help protect skink habitat. 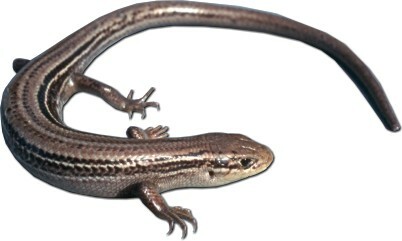 Providing the appropriate information and techniques to landowners will facilitate their making land use decisions that benefit skinks. This project will focus on building the SOS website thereby providing information, and facilitating data collection and information sharing, for landowners within the known geographic range of the prairie skink in Manitoba. It will also serve to promote greater awareness of this species within Manitoba and worldwide. The known range of the prairie skink in Manitoba includes approximately 700 sq km in south-western Manitoba. Most of its known habitat occurs in the Assiniboine Delta deposits east of Brandon. A smaller population occurs in the Lauder Sand Hills region southwest of Brandon. Though the focus of this project will be to inform and involve private landowners, it is hoped that major public landowners such as the Dept. of National Defense (CFB Shilo) and Manitoba Parks (Spruce Woods Provincial Park) also will be involved. The Manitoba 2007-08 Habitat Stewardship Program: “Species and Landscape Priorities” lists the Prairie Skink, with its status as "Endangered", as a high priority species. Furthermore, it considers the landscape of the Prairies Ecozone, and specifically: "Southwestern Manitoba, mixed-grass prairie, sandhill prairie, aspen parkland and riparian habitats within known ranges of species at risk", to be among its highest priorities as well. The prairie skink is a prime indicator species of high quality mixed grass and sandhill prairie habitats. Involving landowners and managers in preserving or enhancing critical habitat for prairie skinks will aid in conservation of many other mixed grass and sandhill prairie species. Developing a data gathering and information sharing component to the SOS website will encourage landowners and the general public to get involved with skink conservation. It will help instil a sense of ownership and responsibility for the welfare of these small reptiles in this province. Making Manitobans more aware of skinks will result in more people caring about skinks, and in turn promote the right conservation decisions and actions being taken. a) raise awareness of the prairie skink in Manitoba and the threats it faces owing to increasing habitat loss and degradation. b) assist private and public landowners working to protect skink habitat, providing them with the necessary information/protocols/techniques to manage their lands to preserve or enhance skink habitat. c) gather basic information on the range, distribution, numbers and habits of prairie skinks and facilitate sharing of that information. An increased public profile for this species may even lead to new populations being discovered. The project manager will consult with local experts and gather all pertinent information and resources (images, maps, diagrams and video) required to develop the content for the informational component of the SOS website. This will include information on the prairie skink’s critical habitat requirements, and methods and techniques for conserving, improving, or creating habitat for this species. An attractive and graphically rich design, to capture people's attention and interest, and simple user interface will be developed for the SOS website. Appropriate HTML or other web programming will be written for the website. At the same time the manager will research and develop the interactive (data collection and sharing) component of the website to ensure functionality and ease of use for a general internet audience. The content (biology, natural history, range in Manitoba, maps, etc.) will be prepared and posted to the NatureNorth.com website for peer review. All text and image content will be vetted through local experts and members of the Prairie Skink Recovery Team (PSRT). The information sharing component of the SOS website will involve creating a system where individuals will be able to post comments, observations or data related to skinks in Manitoba. The types of information posted could range from casual observations to quantified data of skinks and their activities, or observations and data relating to alterations or management of skink habitat. It remains to be determined whether this will be a public area of the web site or maintained as a restricted access component where only registered participants will be able to post or see information. The project manager in consultation with the recovery team will canvass select landowners to participate in a test of the data gathering and sharing component of the SOS website. Once testing is complete and the SOS website has been vetted, it will be officially launched and a public relations campaign mounted to promote awareness of the site to the general public. Information on the SOS website also will be available in downloadable and printable formats (Adobe PDF) for those that wish to produce print copies for use. At least one full-page poster promoting skinks and the project itself will be prepared and made available via PDF download. This project commenced in April 2007. Information and resource gathering will continue until the end of September, 2007. A draft of the entire SOS website will be developed and posted to NatureNorth.com by the end of October 2007. A partial, non-public website will be posted in July 2007 to allow for testing of the interactive components. Testing will continue to sometime in spring 2008. Public relations activities and official launch of the completed website will occur sometime during March or April 2008. NatureNorth.com is committed to hosting and maintaining the SOS website for at least five years from the point of project inception as our in-kind contribution. Manitoba 2007-08 Habitat Stewardship Program Species and Landscape Priorities. Manitoba Conservation. Prairie Skink Recovery Team. 2006. National Recovery Strategy for the Prairie Skink (Eumeces septentrionalis) (Proposed). In Species at Risk Act Recovery Strategy Series. 21pp. COSEWIC 2004. COSEWIC assessment and update status report on the prairie skink Eumeces septentrionalis in Canada. Committee on the Status of Endangered Wildlife in Canada. Ottawa. vi + 22 pp. (www.sararegistry.gc.ca/status/status_e.cfm).